Ben We have a small seasonal gallery. We are fortunate to have been able to work with many generous and professional artists who have enabled us to host some magnificent exhibitions. For us the idea of local is central to what we do. Living where we live ‘local’ is made up of people, culture and landscape - although Freddie and I have different ideas about all those things. For me, the concept of a broader international art context that is somehow better than a local one because it is international I don’t accept. The further idea that engaging with an international context is somehow more politically progressive I think is fundamentally erroneous. To my mind the motors of art production and innovation (if there is such a thing) have always literally been located in a place. 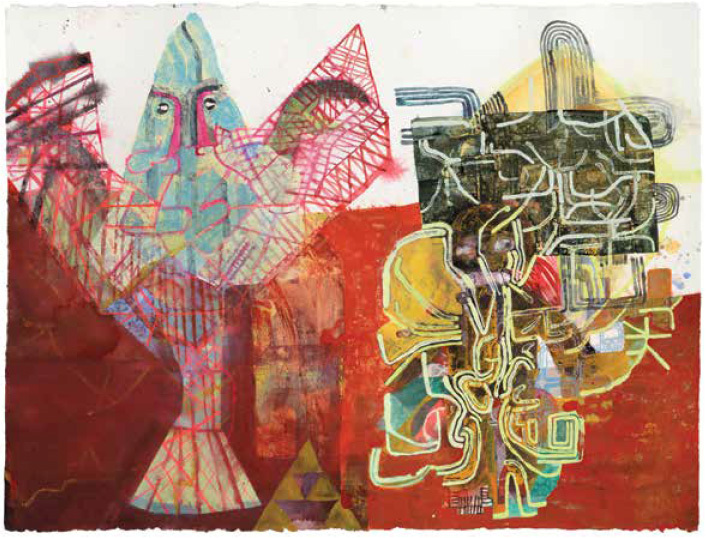 From cave paintings, through Renaissance church painting, to Kurt Schwitters working in Cologne - these are all art that has been produced from and because of a specific and urgent geographic circumstance. I think that aesthetic geographic specificity often remains but it is masked by the ubiquity of globalised markets and institutions. I yearn for particularity, specificity and peculiarity in art production. Freddie Many people have an idealised view of living in the countryside. They desire cheaper and larger housing, a garden, to have more children or a dog, (usually both), better schools, less crime and greater personal safety. A move to the countryside is for many a dream, a dream which, although I do live in the countryside, I do not share. Their dream is my reality. The countryside is undoubtedly beautiful. At times it is downright breath-taking, but what do you do with all that beauty? It does not move, or inspire me, creatively. Where is the ‘grit’ or the ‘rub’ that I found in my urban life that gave me the impetus to be an artist? Unlike Alice Walker I do not want horses in my landscape. I want people, and lots of them, not just walkers who have lost their way. It is people and our very human predicament that I respond to. However, I want my work to have a relationship to my experiences. I want it to relate to the locality in which I live and in which it was made. My practice is essentially autoethnographic. The American scholar and researcher, Carolyn Ellis, defines this as “research, writing, story and method that connect the autobiographical and personal to the cultural, social and political”. In my practice ‘making’ predominantly replaces ‘writing’. Unlike Constable, I do not paint. I knit. A medium idealised and derided in equal measure. An activity associated with the domestic and the parochial, a far cry from what comes to mind when we talk of internationalism. In ‘Someone Else’s Dream’ I make use of the picture knits that were so popular when I was a teenager. In the 1980’s these were regarded as highly fashionable but soon fell out of fashion and have never regained serious appreciation. 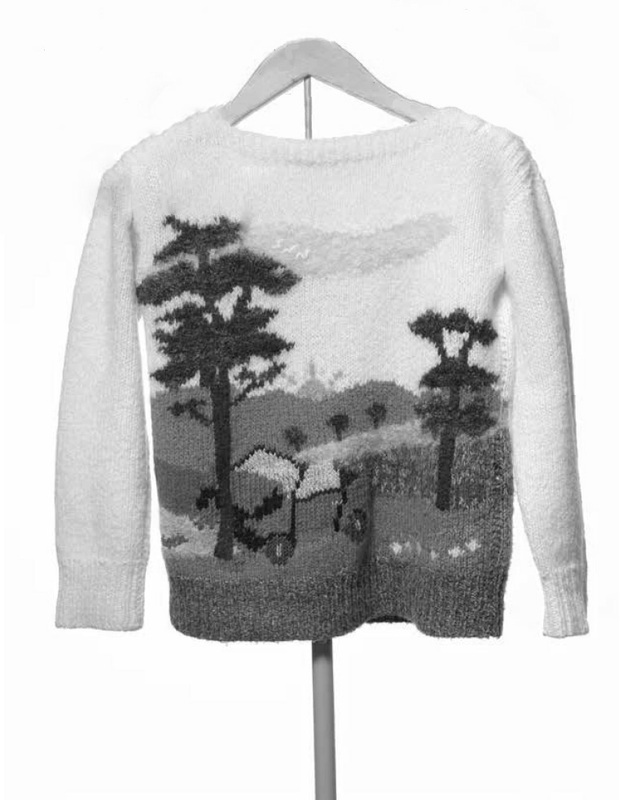 I have been working with picture knits that depict pastoral scenes; farmhouses with animals, villages complete with churches, pretty streams, rolling hills, blue skies and fluffy white clouds. I have not made these jumpers but found them on eBay. Many hours of skilled labour no longer wanted or valued. Using a technique known as swiss darning, an embroidery stitch that mimics the knitted stitch, I have worked on top of the knitted countryside scenes, changing the idyllic picturesque scenes to the scenes of misery that can, and do, happen in the countryside. Upon initial viewing these works have a cosy familiarity but the soft, knitted jumpers are completely at odds with the imagery. The material and form resist their stereotype. They exist as a disturbance to those dreams and a friendly reminder of reality. Ben I wrote a proposal for an exhibition at M100 an artist-run gallery in Odense, Denmark back in April 2017. It is a wonderful optimistic piece of writing about utopian communities trying to make things better for themselves and those around them. And then in June 2017 it was revealed that my neighbours, even some of my friends did not share what I hope are values of tolerance and openness, values I took to be self-evidently for the good. For me this caused a profound and drawn out soul searching. I didn’t want to make art, or put on events for these people. I found a receipt in a MacDonald’s paper sack. The local council can use this to track the person who dropped the litter and prosecute them. I was faced with a dilemma. Should I hand in the receipt, an action with unknown and potentially catastrophic consequences for the individual involved? I just put the whole package in the recycling bin. Who am I, from my super quinoa privileged, white middle kale aged home owning male over-educated well-travelled CO2 producing position, to stand in judgement on this person? I stopped picking litter. Landscape and the countryside has become a central theme of my curatorial and artistic interests because the land is politicised more than ever. It is the chemical and biological battleground between the EU and the US. The folksy countryside is the locus of much of English identity, close-knit village life, country pubs, winding lanes, thatched cottages, baking cakes, jam making and cricket. Our identity may appear to be embedded in the rural, but it is the urban, by which I mean London, that dominates. UK farmers, who operate a precarious custodianship of the landscape, are tied, often reluctantly, to sustainable environmental policy under the terms of essential EU subsidy. Farmers rely on the free movement of people, attracting farm-skilled workers, no longer available in the UK, from the Balkans and Baltic. The Blackwater Polytechnic is a visual art organisation operated by Freddie Robins and Ben Coode-Adams as an umbrella for their events and curatorial projects. They are based on their family’s blackcurrant farm in rural Essex in a barn which they have converted into a live/work space. This article features in the Autumn/Winter 2018 edition of the Sluice magazine which explored localism, transnationalism and internationalism. Subscribe or buy via the link below.